Cut each chicken breast in half. Place them on a cutting board and use a sharp knife to cut open each piece as though it were a book. Place each piece in between two sheets of plastic wrap and use a little hammer to thin them out a bit. Season with salt and pepper. Add 4 to 5 asparagus on the border of each roll. Roll like a pinwheel and tie it up with kitchen string. Heat the oil in a saucepan over medium heat. Add the rolls and brown on both sides. When they're ready, pour in the chicken broth and passion fruit or pineapple juice. Cover the pan and lower the heat all the way down and let cook for 15 minutes or until the chicken is cooked in the center. Remove the breasts and put them on the cutting board. In the meantime, boil the sauce so it reduces a bit. Finally, turn off the heat and add the butter to give the sauce some shine. In the meantime, remove the string and cut the rolls into slices using a sharp knife. 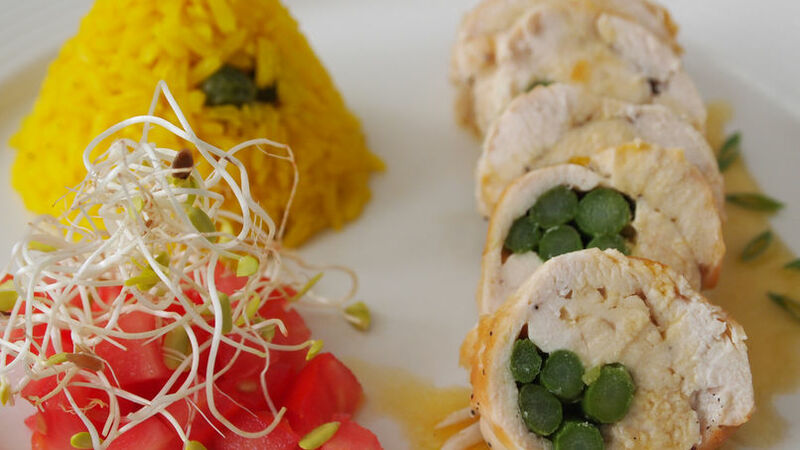 Serve the rolls with rice with saffron and peas, bean sprout and tomato salad with a salt and a bit of vinaigrette. Add strips of grilled pepper with the asparagus to give the dish more color. Serve mashed potatoes instead of rice. If you don't want to make sauce, add two tablespoons of butter to the saucepan where you fried the chicken, the juice of half a lemon, salt, pepper, one teaspoon of parsley and a teaspoon of capers. If you want a creamy sauce, add 1/2 cup of heavy cream to the saucepan. Bake the rolls instead of frying. Put them in a baking dish with heavy cream and bake for 35 minutes or until they're ready. Many people believe that chicken breasts are boring and not useful for creativity in the kitchen; they also complain because it’s a very dry cut with a difficult cooking point. But I assure you that there are many different ways to serve something so simple, like these rolls that can also be filled in different ways or used in different recipes. Cooking chicken breasts isn't difficult when you understand the right cooking time and avoid overcooking. My son, from a young age, only eats this part of the chicken so I always had to come up with imaginative, delicious and juicy ways to prepare them. One of his favorite dishes is risotto with chicken breast filled with goat cheese. Sometimes I changed the cheese for some kind of vegetable, especially if it had a contrasting color that made the dish vivid and appetizing. As they say, everything comes in through the eyes first. I also recommend this as a way to get little ones to eat more vegetables. It's important to get the used to seeing different colors on their plate from a young age so they know that they can eat everything because it's delicious and good for them. If you have young children, let them help you prepare the food so they learn the name of all the vegetables in the process. You can consider these rolls as a diet dish. If you cook the rolls in a nonstick pan and avoid the butter in the sauce, they're a perfect addition to any salad. Light and delicious, give it a try!